Is this your first AKA Convention? Has it been some time since you attended convention? Have you attended before but don’t know many others who are here? Have you attended conventions before and would like to help new and returning attendees learn the “INS & Outs / ups & downs” of this terrific gathering of kite fliers? If you answered “yes to any of these questions, PLEASE JOIN US for an opportunity to meet other kite fliers and to hear ways to get the most from a convention experience. This is your chance to meet the judges, find out what they are looking for, and how they determine who wins. This is going to be another exciting year with new competitors and many returning makers, bringing their best to AKA Nationals. We can hardly wait to see what’s in your bag! Drones and Kite Aerial Photography – What happens when a drone hits your kite line? Come and learn the answers to questions like this and many more. In this workshop you will get a unique look into the world of working kites. Show and tell of KAP equipment, photos, how to get started in KAP and selecting what will work for you. Ken Conrad has 20 years of KAP experience and owns the KAP gear web shop Brooxes.com. Jim Powers has help edit and participated in several KAP photography books with over 10 years experience. Make a Miniature Sled Kite with the Convention Logo! Make a miniature sled kite with 2016 AKA Convention Logo! Complete with carrying case and flying stick. Kites will be tissue paper with nylon spars. All supplies and tools provided. Make an amazingly capable indoor glider using a plastic trash bag, wooden dowels and scotch magic tape. This kite has been used in competition and is a good workshop project for older kids. Immediately after making your kite you are welcome fly your new glider in the Indoor arena. A quick look at the evolution of an idea from a casual observation into a finished kite. Robert Brasington has focused his attention on single line kite design and creations for some 20 years now. Come hear how Robert works from ideal to creation, using kite making materials and colors he has collected from around the world. Explore the world of digital design and fabrication. In this workshop you will be introduced to the basic principles of digital design and fabrication, with a focus on the emerging technology of 3D printing, and how it applies to kite making. Primarily we will discuss designing and 3D printing custom kite fittings. We will talk about different types of printers, their strengths and limitations, the different types of plastics available and how to choose which one to use. We will also cover one of the most asked questions, “Do I really need to own a 3D printer, or can I send my designs to someone to print for me?”. Understanding these processes will enable you to envision and create your unique designs. During the workshop a 3d printer will be setup to print one or more kite related items. Others items will be on display. ○ SketchUp a powerful easy to learn 3D modeling program. And it’s free! ○ Pepakura a paper folding program used as an aid in converting your 3D models into printable patterns. ○ 3D printing using the 3D printer for making custom fittings. If time permits, you will be able to purchase and assemble a NoSew Tyvek 6’ wingspan Seagull Kite Kit complete with fiberglass framing and 3D printed fittings. Donna started flying indoor kites after making her own at an AKA Convention in Seaside several years ago. She’s been “dinking around” with the indoor kites for a while now and really loves competing with her Karl Longbottom’s “Pterodactyl.“ Comes join her Tuesday morning for indoor flying tips and pointers. Bring your own Indoor kite. Statuses, Tweets, and Vines OH MY!! Are you responsible for the outreach and marketing for an event or business and are trying to figure out how to best use Facebook, Twitter, YouTube, or one of the other major social media platforms? Is the thought of managing your social media accounts kind of scary, and time consuming? Come to this interactive workshop where we will discuss how to get control over your social media. Learn tips for making the most of your time spent online, and make viral marketing work for you effortlessly. Would you believe that you can meet your goals, increase exposure, and get your message out with as little as half an hour a week… and have it all for free! AKA Social Media Manager Nic O’Neill will be leading this workshop. Using the AKA social pages as a backdrop, we will talk in detail about what has worked, what hasn’t, and how it applies to your event, organization, or company. We will also be discussing how to target the Tech Generation, and how to interpret demographic shifts in your marketing strategy. If you are just a consumer of social media and want to know how this all works, stop on by. Workbooks, resources, and other materials will be provided along with one on one follow up. Gary returns this year to teach a new fighter kite designed for both beginners and experienced fighter kite flyers. Come and make your own fighter kites. This is your chance to learn hands on, from one of the best Fighter kite makers and Multi – time winner of National Fighter Kite Championship Competitions. Please, if possible, bring: scissors, pencil and a ruler. Bob Hegman is National Champion fighter kite flyers, along with other National champions and experienced flyers will give hands on lessons on how to fly a fighter kites. It’s easy to get started and with practice, you too can experience the excitement of flying a fighter kite. You have seen how some products, companies, or individuals have raised thousands of dollars in a short time. Some are ridiculous, like the man that raised over $10,000 to make a potato salad, while others are more serious like the woman who raised $254,000 for a heart transplant. But, where does the money come from and how are people able to raise this kind of money? In this interactive workshop hosted by Nic O’Neill we will discuss how crowdfunding works, how you can reach your target audience, and what it takes to make your campaign successful. Bring an idea for something you want to raise money for, it can be serious or ridiculous!! This annual meeting allows sport kite competitors the opportunity to meet with members of the sport kite committee and judges to ask questions, make suggestions, discuss rules, and offer ideas and direction for promoting the sport. Christian will demonstrate how he creates his kites using his own multiple colour appliqué technique. The implementation of a hot knife to cut ripstop on a light table. The matching of multiple colours using tracing paper and the adhering of said to one another with textile glue before sewing. 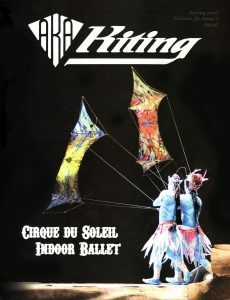 Jose and Scott bring together over 50 years’ experience in kite design, kite building, and kite flying to present this hands-on workshop of imaginative paper and bamboo kites. Jose presents his three-stick approach with organic designs that at one moment might suggest a heraldic shield and at the next, a butterfly. Scott starts with the traditional American barn door kite and manipulates three equal-length spars into new hexagons and X-wing swallows. Students should be prepared to design and construct unique three-stick kites inspired by Jose and Scott’s starting points. Pattern Making with the Diva! Come and learn how to Northwest kite Diva makes patterns for hot cutting on nylon. I will show you how I start with an idea then turn it into a poster board pattern, then show you the tools to turn it into a ‘sheet metal pattern’. I have been cutting out my designs this way for 36 years. It’s just natural for me. “If I can feel it on my neck, I can Fly”. Mark flies on short lines, around 30 feet, and loves flying in the parking lots near where he lives. With a consistent breeze from any direction you can have a good time and get some relaxation and talk with people. Short line flying makes it easy to deploy you kite and be flying in minutes. Come learn some techniques for short line Rev Flying. Feel free to bring your own kite too. In the Kite Makers’ Post-judging Workshop we will go over the scoring statistics and gather your observations about this year’s competition. We will discuss possible rule changes and collect your opinions to take to the Kite Makers’ Committee. Would your butterfly kite be natural or whimsical – vivid or subtle? Let your imagination go with choice materials for decorating a Tyvek butterfly. Assemble a lifelike, versatile GW Butterfly kite with your one-of-a-kind sail and learn cool things about tuning and flying. Kite and decorating materials are all provided. Big kites safety; where, how and what of preparing yourself for an accident free fly. Danger signals; what to look for that needs to be fixed. How to anchor a big kite. Sand anchors and other anchoring methods. Line and gear for flying. How to launch; can I do it by myself under safe conditions? You will actually do it! You will prepare, set up, launch and fly and take down a big kite on the beach with your friends. You might know some of this stuff but it will be entertaining and interesting…I hope. Bring your sense of humor. It’s going to be fun! Most kite fliers will try a dual-line kite at sometime. Some will like it, some will decide it is to much work, but there are ways to fly the kite that will help you advance your skill set. We all look better and get more enjoyment out of our kites if they do what we intended them to do before we put them back in the bag. The intention of this class is to help you show your kite what your intentions are while you are flying it.